Easter morning is only a few weeks away! Have you decided what to play yet? We have chosen one each of Piano and Organ collections to present to church organists and pianists. Both collections are new this year. 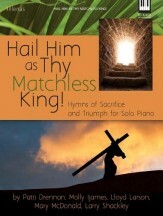 “Hail Him as Thy Matchless King!” is a collection of ten advanced piano solos. There are hymn arrangements for Palm Sunday through Eastertide. Five different arrangers have arranged these pieces, Mary McDonald and Lloyd Larson among them. This year’s organ solo offering from Lorenz Music is “With Love That Has No Ending.” There are organ arrangements for Lent, Palm Sunday, Holy Week, and Easter. Douglas Wagner has compiled this collection, with arrangers including Lani Smith and Robert Lau. For more information about these collections, or other Easter collections, call us at 1-800-42-MUSIC, email us at [email protected], or visit our website, http://www.stantons.com. Shop Stanton’s for all your sheet music needs!